As a young kid, I always loved traveling by train. It’s such a great way to truly see the landscape while traveling! In just a few weeks, my family is setting out on a train journey across the United States, and we can’t wait to see what’s out there! 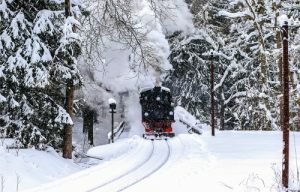 There’s something so magical about winter train routes and we are hoping we see tons of wildlife. 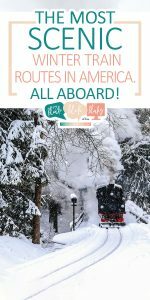 It took us a while to find what we considered the best winter train route in America, but we were pleased with what we arrived at. 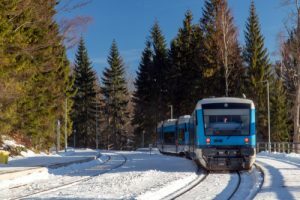 Keep reading to see the other winter train ideas that were up for consideration. This 12-hour train ride sounds long, but you’ll be transfixed with the scenery the entire time. The train passes near Denali National Park, so you’ll have a terrific (hopefully unobstructed…pesky clouds!) view of the summit as well as great views of wildlife. There are stops along the way so you can see what life in Alaska is like! This is the one my family and I chose because believe it or not, we think Yellowstone is even prettier with snow! Travelers will depart on a five-day journey from Salt Lake City, Utah and spend some time enjoying the steamy geysers and wildlife at Yellowstone National Park. Lodging is included, so be sure to get your tickets before they go too fast. 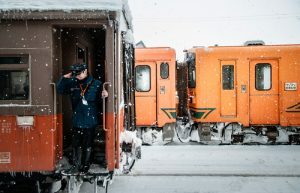 Unfortunately, our youngest doesn’t yet have his passport, or this winter train ride would have won out! Travel from Seattle to Vancouver, Jasper, Banff, and Calgary while stopping for a few days in the Canadian Rockies. Your trip will come to a close when you return to Seattle nine days later. You can find more information here! If you’re looking to get away from the sharp chill of winter, head out to California for a trip through Napa Valley. Stop at popular wineries throughout the valley as the train travels. If you ask me, this makes traveling by train much more enticing! Speaking of warm weather, this train ride will take you right to it! It’s oddly satisfying to watch the snow melt away as you make your way to the beach. Don’t forget to hit the beach during your time in Los Angeles, tanned skin is always the best souvenir! There’s something about train rides to Canada that sound so magical. This Amtrak train ride was considered one of the most beautiful in the world and once you’ve relished in the snow-capped peaks, it’s easy to see why. Bring your skis, there might be a chance to whip them out!